The Net of Stars: 2013: Star Party Bonanza! My summer schedule is usually all over the place, and if I can make it to one star party I'm doing well. It seems sometimes like all the new moons fall on busy weekends; if it's not that, there may be several star parties at the same time. Then there's the Minnesota State Fair baked goods entry day, the August Sunday fifteen days before Labor Day. 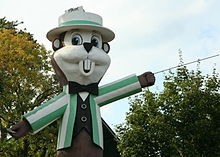 "Fairchild," mascot of the State Fair. What, you've never seen a gopher wearing a bow tie? For a few days leading up to that I'm usually baking furiously in preparation. What can I say, I like baking bread, and I like winning ribbons. The Ribbon is what it's all about. Disagree? Get your priorities straight. And on top of all that, there's earning a living. Oh, to be retired and financially secure! Years to go before that happens, if ever. I teach Friday night and Saturday afternoon science courses that typically run through the end of June. That puts a crimp in attending the usual Thursday through Sunday parties. Wisconsin Observers Weekend, near Waupaca, WI. This was my only summer party last year, and I really enjoyed it. In 2013 it's in June, on an off weekend for me! Jeffers Petroglyphs informal party (nee Prairie Grass Stargaze), near Windom, MN. My favorite star party. Hard to do better than the people who stage this and attend, and the setting is made all the more sublime knowing that an ancient Native American observatory has been found nearby. Northwoods StarFest, near Fall Creek, WI, and hosted by the Chippewa Valley Astronomical Society. Never been to this, but it's close and most people speak highly of it. Iowa Star Party. I've missed this for the last few years. This is where I was introduced to real astrophotography by some very nice imagers. Someday I hope to exact my revenge. I don't know if I can handle all this dark site time, but I'll try. Next time, some words about Astrobin, where I've started posting images. There's not much else to talk about thanks to the clouds and cold weather.